In life and business, I've always felt it was important to read between the lines, to listen to how people say something as well as what it is they tell you, and to pay attention to your dreams and to your intuition. Doing so can change your fate—and in some cases, save your life. Many years ago, my wife Anne, my two daughters, and I were visiting with Anne's parents on a small island just off Victoria, Canada. My in-laws offered to watch the girls overnight so Anne and I could enjoy some relaxing time by ourselves on the other side of the island. The island was very scenic, and our drive would be interesting, taking us on roads where logging trucks once went, along the hillside, with rivers on the other side far down the hill. It was a nice break from the heat, humidity, and flat terrain of South Florida, the place we now called home. Still, while I looked forward to our alone time, I kept having a recurring and disturbing vision that started when we first got on the island: I was trapped under-water, and I couldn't break through to the surface because it was covered by thick glass. I couldn't figure out what this was all about, and the unsettling feeling stayed just below the surface of my consciousness. We had rented a car in Seattle and took a ferry to the island. The car was fine when we left the rental agency, but when we landed on the island and began our drive to the other side, the vehicle started feeling strange. I couldn't quite put my finger on it; the brakes and engine seemed to be working—which was good because we would be driving up and down mountainous roads—but something about it just didn't seem right. I, too, started feeling out of sorts, but we continued along, looking forward to our mini vacation. We hadn't made reservations for a place to stay, thinking we would find lodging there easily. When we arrived at our destination, we were surprised and disappointed to discover that not a single hotel had a vacant room. We had no choice but to turn around, so we started our journey back. Traveling along, we discussed how sad we were that we couldn't stay when an enormous black bear came bounding across the road, seemingly out of nowhere. I slammed on my brakes to avoid hitting it. Anne and I were momentarily speechless—though afterward we laughed about it, wondering how we would have explained hitting a bear! My heart was beating at a fast and furious pace, and all my senses were heightened. The foreboding feeling came back, now even stronger. A short time later, as we were heading up a small incline in the roadway, I lost control of the steering and the car began to fishtail, drifting wildly from left to right. My wife was totally scared, and I fought to control the erratic movement as we were coming up to a hairpin curve. I suddenly got control back, and Anne and I both breathed a huge sigh of relief. It was short-lived because the next moment I lost control again. Just as that happened, I had my recurring vision of being underwater, under glass. That thought caused me to react. I followed a strange gut instinct that, on any other day, I would've considered insane: I turned the steering wheel hard to the right, causing the car to crash into the ditch on the right side of the road. Seconds later, an enormous semitruck loaded down with logs came barreling around the curve. Driving far too fast for this narrow part of the road, it was halfway in our lane. If I hadn't driven into the ditch, we would have been smashed to smithereens, and likely would have ended up tumbling down the hill and into the frigid waters of the river below. Anne and I had a few bumps and bruises, and the rental car was worse for the wear, but we were alive—and thankful to be here, ditch and all. I held Anne tightly, tears of relief and gratitude filling my eyes, thinking about all that could have happened but did not. The police officer who arrived soon after to sort out the incident told us we were lucky to be alive, but then in the next breath wrote us a ticket for parking illegally—in the ditch. We were dumbfounded, but at least she apologized for having to do it. Rules are rules, apparently. When we returned home, I shared our story with one of our authors and conference speakers, Jane Middelton-Moz, who has great knowledge of native people's spirituality and symbolism. "Peter, the bear was a warning of danger," she told me. "It saved your life." I knew that it was true; I was trying to push away my vision of being in the river, but the bear wouldn't let me. The next time I saw Jane, she gave me a gift: a talisman from a Native American who said I should carry it with me if I ever visit the island again—which I haven't done, nor will I ever. Since this experience, I knew for certain that even if your head tells you something that is logical and makes perfect sense, it is your heart that will always lead you in the right direction—and that just might be into a ditch (better than the alternative)! We need to listen to our guardians from above. While they cannot help directly, they can create thoughts, feelings, visions, etc., that we need to pay attention to, and let our gut (spiritual instincts) guide us to do the right thing. ©2018 Peter Vegso and Gary Seidler. All rights reserved. 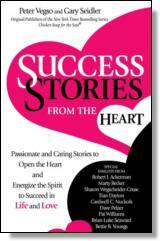 Reprinted from Success Stories from the Heart: Passionate and Caring Stories to Open the Heart and Energize the Spirit to Succeed in Life and Love. No part of this publication may be reproduced, stored in a retrieval system or transmitted in any form or by any means, without the written permission of the publisher. Publisher: Health Communications, Inc., 3201 SW 15th Street, Deerfield Beach, FL 33442.